Any blank blocks indicate that the data is not yet available. Please contact us if you need any such information. Click on the EXTENDED INFO link for more information about the particular bullet. 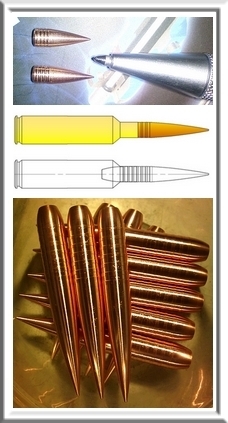 .17 Cartridges, subject to bullet specifications. Mag/Single feed. 22 Hornet, 22 K-Hornet. Mag/Single feed. 222 Rem, 223 Rem, 22-250. Mag/Single feed. 7-08, 7mm RM, 7mm WSM, 284 Win, 280 Rem Not for .285" Cals. 7 mm KM, 7 mm Rem. Ultra Mag, 7 mm Win. Short Mag, 7.21 Firebird, 7x61 Super, 7 mm Rem. Mag., 7 mm STW, 7 mm Weath. Mag., 7 mm - 08, 280 Rem., 7 mm Exp. Rem. Not for .285" Cals. Mag/Single feed. .338" - Lapua Magnum and smaller cases. Single feed. .338" - Lapua Magnum and smaller cases. Single feed. 375 VM, 375 Snipe Tac and similar. Single feed. 408 standard and LRB bore.